← Cutwork borders – a tutorial and a freebie! A year ago, I was thinking about how I wanted to launch my range of embroidery designs. I felt it wasn’t enough just to create a period design and put it out on the internet. I also wanted to create beautiful samples that would get people excited and imaginations running. I didn’t want a lone design out there, so I was thinking in terms of collections. Then I started thinking about samples and models and photo shoots – and wow. That is a LOT of work. To be honest, striving for that level of marketing right from the beginning just isn’t possible. I still want to do it, but these days, I’m seeing the sense in the saying “Perfect is the enemy of done.” I already have a lot of work with a steep learning curve on my plate, and I shouldn’t complicate it any more than I have to. That tendency towards perfectionism is hard to fight, but I can clearly see that it’s already delayed me over a year. Instead, I have decided to release items on Etsy as they become available. They may need fine tuning over time, but that’s OK. I may or may not make bigger samples of every single one, and that’s OK, too. I plan to put out a few more designs each month and wait until I have a better handle on that process before I dive into other types of marketing. This month, I have three designs up. My favorite is this 18th century ladies’ pocket. It’s based on an extant pocket in LACMA’s collection, and the design file contains both the embroidery files and a PDF pattern and instructions for sewing the pocket. 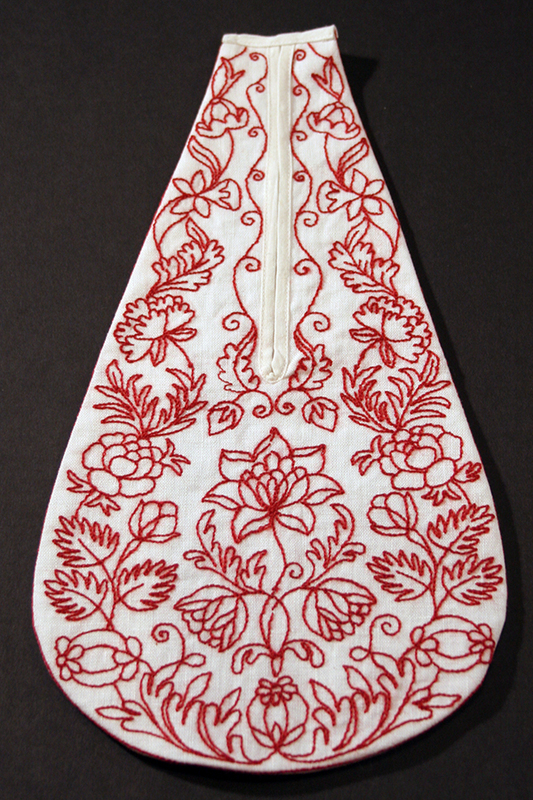 I really like this pocket because of the unusual elongated shape and graceful floral embroidery accented with pomegranates and strawberries. 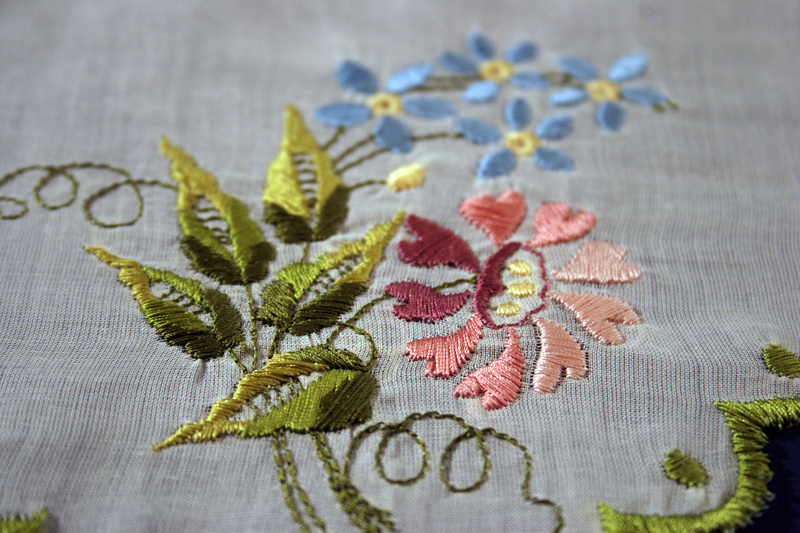 When stitched in wool blend thread on linen fabric, it has a nice period feel and texture. The samples in the photos are finished with cotton fabric as lining behind the embroidery and for the back of the pocket. The slit and top of the pocket are bound with white linen tape. I found it interesting that the body of this pocket was stitched and turned rather than bound. I also have two border designs inspired by images from Ackermann’s Repository. 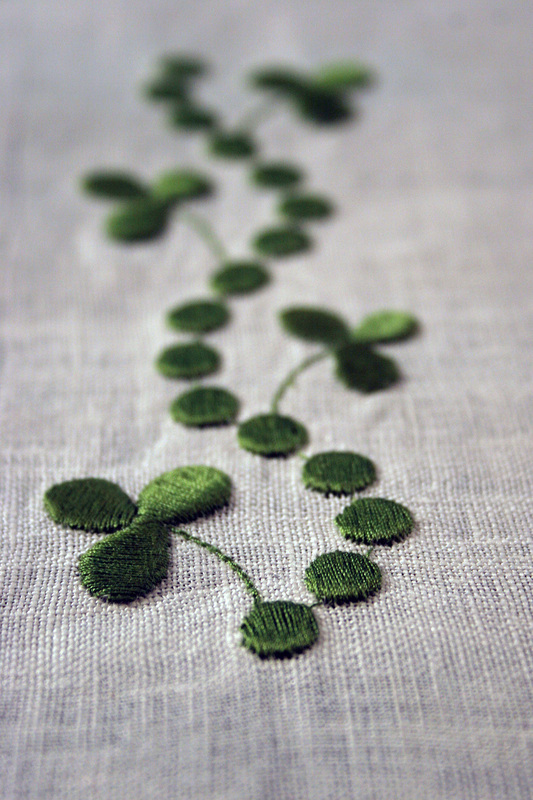 The first is a delicate clover design in two widths, based on a design originally published in August, 1812. The second is a floral border with a scalloped edge, based on a design published in October, 1821. 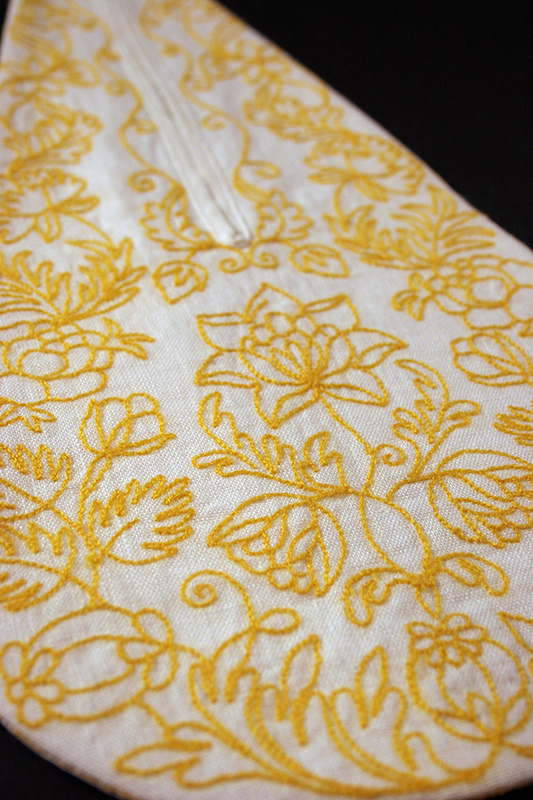 This design looks just lovely in silk embroidery thread, and has the option of being stitched with a cutwork border. 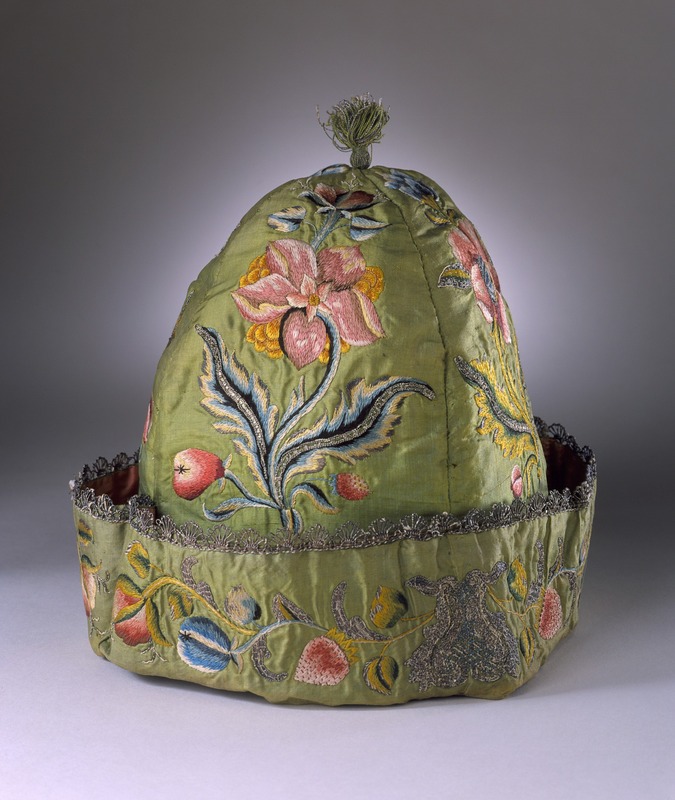 I have more caps pinned on my Pinterest Board, Embroidery – Caps and Coifs. What would you like to see me make? I’m always open to suggestions.